DURHAM, N.C. (December 2018) Skeletal (mesenchymal) stem cells (MSCs) are being used in an increasing number of clinical trials for their therapeutic benefits in tissue regeneration and fracture healing. However, their poor homing capacity to the injured site presents a major challenge to realizing their full capabilities. A new study recently published in STEM CELLS shows a possible way to overcome that. The study was conducted by a team led by Moustapha Kassem, M.D., Ph.D., of the Novo Nordisk Foundation Center for Stem Cell Biology (DanStem), Department of Cellular & Molecular Medicine at the University of Copenhagen and Department of Endocrinology, University Hospital of Odense, Denmark. It focused on understanding the mechanisms regulating recruitment of human MSCs (hMSCs) to the injury site — a prerequisite for their successful use in cell replacement therapy. The team was able to demonstrate that TAFA2 stimulates hMSC migration through activation of Rac1-p38 signaling. “We were also able to show that TAFA2 has a chemo-attractant activity for hMSC and is overexpressed at the site of the bone fracture,” Dr. Kassem said. Upregulation of TAFA2 levels was detected during the inflammatory phase of fracture healing in the mice, as well as in patients with hip fractures. The team found that TAFA2 did not affect the differentiation capacity of the cells, but that it enhanced their proliferation and cell recruitment to sites where bone formation is needed. 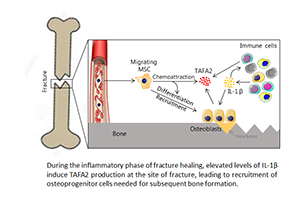 “As a result, we think that our findings demonstrate that TAFA2 enhances hMSC migration and recruitment to sites of bone fracture and, thus, is relevant for regenerative medicine applications,” Dr. Kassem said. The full article, “TAFA2 induces skeletal (stromal) stem cell migration through activation of Rac1-p38 signaling,” can be accessed at https://stemcellsjournals.onlinelibrary.wiley.com/doi/full/10.1002/stem.2955.